HONG KONG (AP) — Chinese e-commerce giant Alibaba has announced that it’s buying Hong Kong’s leading English-language newspaper, the South China Morning Post, as part of a plan to create a global platform for news about China. Alibaba Group Holdings Ltd., founded by billionaire Jack Ma, said it signed a deal with publisher SCMP Group to buy the Post and the company’s other media assets, which include magazines, outdoor advertising and digital media. The newspaper said in a story on its website that the purchase price is not being disclosed. The acquisition gives control of the Asian financial center’s most prominent English-language publication to a mainland Chinese company. As news emerged over the past few weeks that the two parties were in talks, there were fears that the newspaper’s reporting would be softened under new owners. In a statement, Alibaba Executive Vice Chairman Joe Tsai dismissed worries that the editorial independence would be compromised. “In reporting the news, the SCMP will be objective, accurate and fair,” he said. The Post has a wide international following for its China coverage, including reporting on the 1989 Tiananmen Square crackdown and extensive coverage of last year’s pro-democracy street protests in Hong Kong. The newspaper has won awards for its coverage of political scandals and human rights in China, topics that are off-limits to mainland media. The Post and other news media in the former British colony have more freedom to report because the city has a mini-constitution that guarantees freedom of the press and other civil liberties not seen on the mainland. However, there’s widespread concern that press freedom is shrinking as Beijing, which took control of Hong Kong in 1997, tightens its grip on the city. The 112-year-old Post was once reputed to be the world’s most profitable newspaper on a per-reader basis, although its fortunes have suffered in line with the wider decline in the traditional newsprint industry as readers shift to online news sites. Its influence has also been overtaken by Chinese dailies since Beijing took control of the city from Britain in 1997, although it still retains an important position among the city’s English-speaking elite. “Why is Alibaba buying into traditional media, considered by some a sunset industry? The simple answer is that we don’t see it that way,” Tsai said as he outlined a lofty vision of marrying Alibaba’s experience in technology with the Post’s journalism track record to create a China-focused media giant with an international audience. 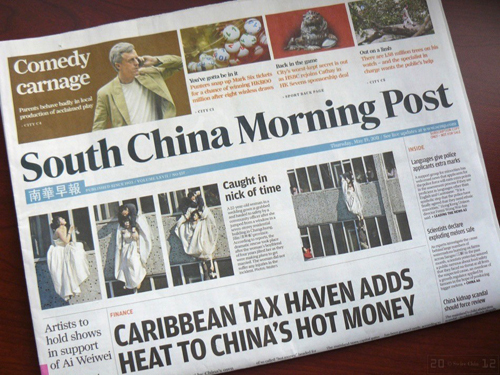 As part of its goal to broaden its readership, the company plans to stop charging for access to the Post’s website, SCMP.com, Tsai said. “Our vision is to expand the SCMP’s readership globally through digital distribution and easier access to content,” he said. The newspaper’s magazine division has a license to publish the local Chinese-language editions of Cosmopolitan and Harper’s Bazaar. It also has a stake in the Bangkok Post newspaper. It took its first step into e-commerce in October by buying a majority stake in fashion site MyDress.com. The newspaper’s current owner, Malaysian sugar tycoon Robert Kuok, bought it through his Kerry Group from media mogul Rupert Murdoch in 1993.